Beautifully engraved receipt certificate from the St. Louis, Kansas City & Northern Railroad Company issued in 1873. 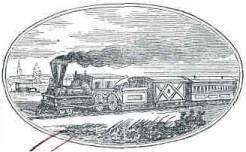 This historic document has a border around it with a vignette of a locomotive traveling down its track. This item is over 130 years old.